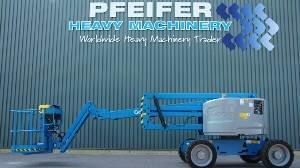 All the offers in the stock of GENIE articulated boom are up-to-date as well as in good shape. Gross Vehicle Weight: 7402 kg. Wheel formula and suspension type: front tires: 100 %, rear tires: 100 %, tires: Outrigger. Max. lifting capacity: 227 kg. The unit’s location is in Groenlo, Netherlands.